From my recent blog post regarding setting up vCenter, I had difficulties locating the area to apply the vCenter license. 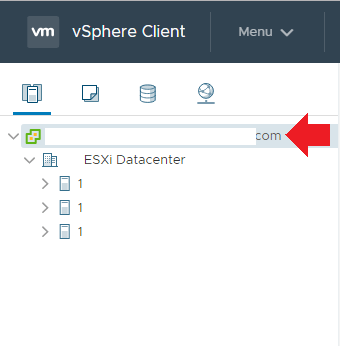 From what I found on the internet, it was referenced that you should go to the Host that contains the vCenter/VCSA VM, click on the VM and click on Configure. Maybe VMware changed it in version 6.7 but I could not find the same area for license registration under the VM itself. Under the VCSA VM –> Configure –> Settings, I should see a ‘License’ section. I could not find anything of that sort. I logged in as my admin account and my personal admin account, both that have the license role and that feature was still not available. Frustrated, I did some looking around within the vSphere client and I found the area to do this. You need to click on the ‘top’ FQDN vCenter identifier on the left hand side of the window, which houses your Datacenter and the nodes inside. 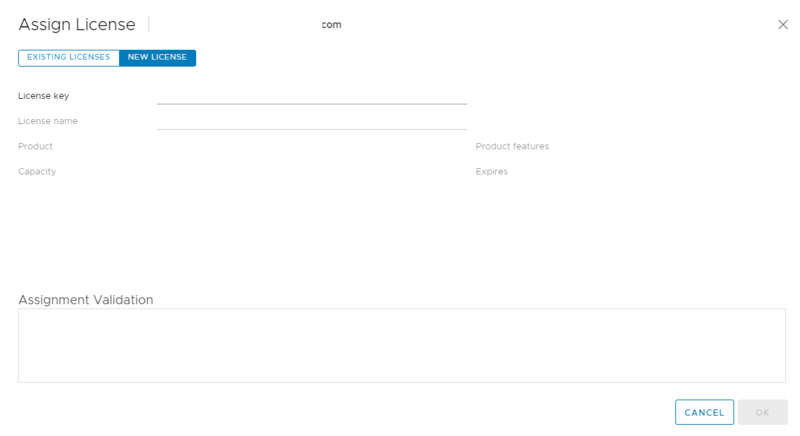 As you see, now selecting the VCSA and going to the Configure section and under Settings, we now see Licensing as an option. Now in my case, I’ve already applied the license but I’m going over where I went to do this. You would select the Assign License button to proceed with entering your key into vCenter. Under the Assign License window, you will have two options. To select an existing license or new license. You can import the license from your License section from the admin page or you can type in your license if you haven’t already done so. I’ve already uploaded my licenses to the Administration License section, which I will show next. Now what I have done initially was gone into the Administration section –> Licensing –> Licenses and typed in the VMware vCenter Server 6 Essential vCenter license key. When I did this, the usage of the vCenter license was set to 0 and capacity was set to 1. This was because I never assigned the license to the vCenter itself. I did this in the Assign License window as seen above. The last and final screenshot above shows the Administrator License window which identifies my License(s) and their state and capacity. To note: When I was in the process of importing each host, the license for those hosts registered automatically here. I did not have to enter the VMware vSphere 6 Essentials Plus License. Those just followed with each host/node into vCenter. I’ll come out and say it, I’m not an expert or a confident user of virtualization and more specifically VMware products. Over the last bit, I’ve taken on a more senior and technical lead position at my job and that involves more to do with the infrastructure side of things and not as much ‘customer facing’. I’ve played around with VMware Workstation and Oracle VirtualBox but I haven’t done a hole lot in regards to ESXi, vCenter and the works. I needed to ‘pull up my big boy pants’ and start learning as much as I can in the short time frame about our production ESXi cluster, trying to understand the configuration and anything that may be wrong with it. When my department slowly withered away until it was only me, I’ve heard that our vCenter is broken and that management of the cluster is not possible. Not having VMware support, I was really concerned about this broken system and how it would negatively affect our production and highly critical cluster. I started doing some reading and came to realize that vCenter (VCSA) is only a central mangement feature. Rather than using vSphere client to manage each invidivual node/host, vCenter allows you to manage the hosts all together (in a cluster) and enabled a few features, including High Availability (HA) and vMotion (allowing to move VM’s from host to host without downtime). Knowing this, I spent any downtime I had reading up about vCenter and VCSA. I looked at different installation methods (Windows vs Linux) the pros and cons of each. vCenter can be installed on top of a Windows installation or it can be configured on a Linux machine and often referred to VCSA (vCenter Server Appliance). My first question was regarding what vCenter/VCSA can I use with my cluster? Luckly, I came across a page on VMware site that helps identify the version of ESXi and what version of vCenter is compatible. With that sorted, I downloaded the most recent version of vCenter 6.7U1. I choose to download the Linux installation rather than mess with Windows and use up a license for it. Now with the .ISO downloaded, I searched high and low to find a good step by step guide on how to complete this install. I already shut down the old vCenter VM that was previously created by our IT staff, which was having issued and filling it’s storage with logs. Rather than try to troubleshoot it, I wanted to start with a fresh install. I came across this fantastic link that helped me tremendously for setting up and installing my VCSA. The notes and screenshots helped a novice like myself through this process. As this was a live production setup, I was always fearful of something occurring but unfortunately I don’t have the resources to do it any other way. Anyways, I felt that I wanted to share this quick post and the link to the site that helped me through this process. Good articles go a long way in helping others out and that is one thing I want to focus with this blog site. To provide good information that I discover or come across.